The Antarctic summer has come to an end wrapping up another successful and interesting season. This year I was working as part of the WAS (West Antarctic Support) Traverse. Operating Tucker Sno-cats and Caterpillar Challenger 55 tractors we assisted in the removal of over 100,000lbs of cargo from Byrd. The cargo had accumulated over the years from previous camps. Buildings, tents, equipment, and field supplies such as tools and flagged bamboo etc. were left on the berm. 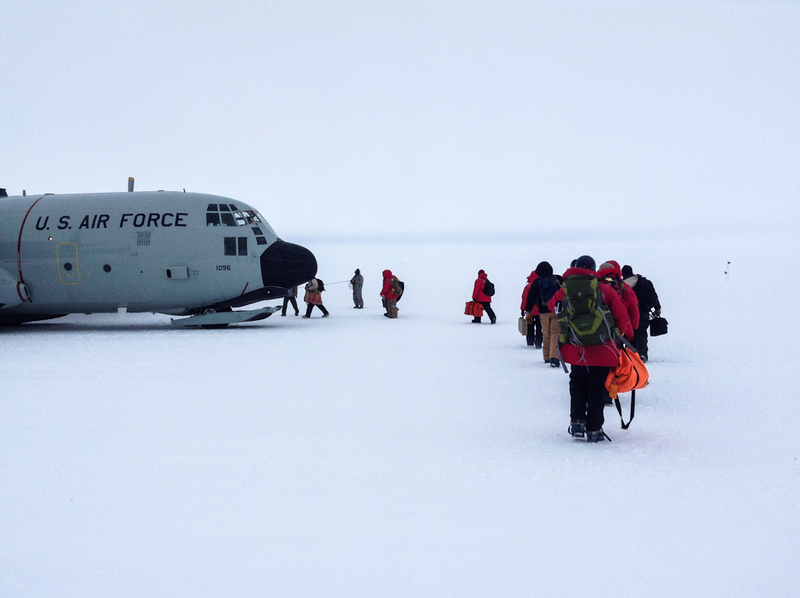 The plan was to fly much of it back to McMurdo for reissue, however many of the scheduled flights to West Antarctica were cancelled due to mechanical issues, weather, and flight priority changes with other operations on continent. With fewer flights the pressure was on us to haul it all back to WAIS where it could be consolidated and flown out next year. It’s a fact of life out here – over winter the accumulation and drifting buries everything. Berms help, raising things on stilts is better, but there is always a lot of digging to be done come spring! This process was much easier with the D4 bulldozer…but even then it took about a day with equipment and another day by hand and hermie to clean out the crevices and melt out the engine blocks. Once the equipment was cleared of snow we did a complete overview, conducting preventative maintenance measures such as fluid and filter changes. Then it was time to set up the sleds. 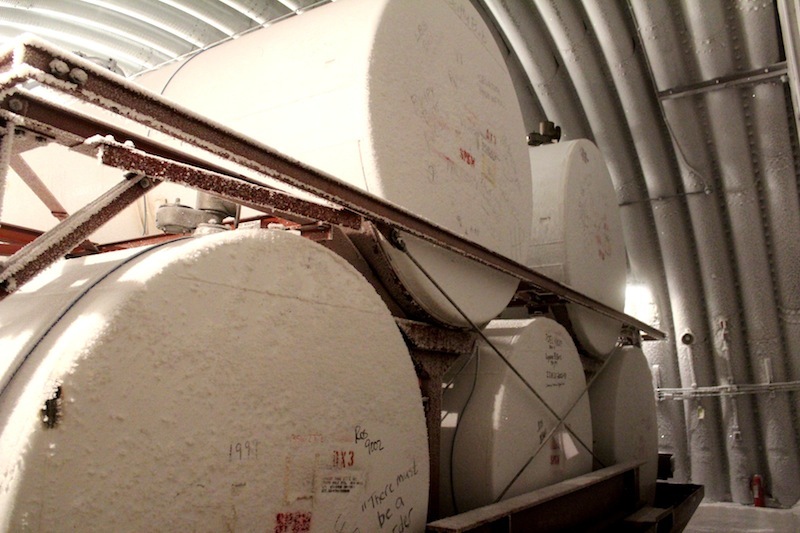 Modern traverses generally use long sheets of high molecular weight (HMW) plastic to haul cargo and fuel. We use black not only because it’s much harder to lose in the flat white, but also because it absorbs solar radiation creating an ultra thin layer of melt water underneath (much like an ice skate). The overall goal is to reduce friction, thus increasing the mass that can be pulled. Cargo can be placed directly on top of the HMW, but especially in the cold it doesn’t take much to damage the surface. Once scratched it cannot be used for fuel bladders for fear of damaging the bladders and risking a spill. A scratch is also a weak point and in the extreme cold everything becomes brittle. The HMW flexes and bends quite a lot as it moves over sastrugi, upsetting carefully stacked cargo. Plastic pallets and vehicles are placed on the HMW while air force pallets are placed on decks. The decks, aka ‘dance floors’ or ARCs (Air Ride Cargo) are wooden platforms supported by air-filled kevlar pontoons. Secured to the HMW they protect the plastic sheets and also provide a stable platform on which cargo can be loaded. By December 4th our gear was unearthed and our systems in place. The Challenger 55s required a fair bit of maintenance and repair so we took just the Tucker Sno-Cats on our first two traverses. The Tuckers can pull around 10,000 pounds each so we were limited to just two sheets of HMW. One Tucker pulled our traverse gear (an Arctic Oven tent, food, and survival gear) while the other pulled replacement skiway flags for Byrd and other gear for the WAS Recovery team. WAIS bid us a grand farewell and we were off. It was just Tyler and I for the first few trips as our mechanic was tasked with getting the Challengers up and running. I have to admit it was exciting, heading off to drive across Antarctica from one camp to another! The whole idea of traversing in Antarctica is exciting and rich with history (as I touched on here:antarcticarctic.wordpress.com/traverses). We were not charting new territory; there have been many traverses between WAIS and Byrd. Nor were we bound to see anything other than flat white and more flat white…no mountains or icebergs or animals (except for a bird or two). Nevertheless, this was my first traverse and I was thrilled! We drove all day, planting flags every half-mile so that we could have something other than the GPS to look at and also to help us stay on the same path as subsequent trips would be much easier on a ‘road.’ The visibility dropped and it became disorienting to say the least. Loaded down we could only go 7-10mph and I tried to relax. With nothing else to look at I stared at the little arrow on the GPS. I tried to drive straight…but after a few moments the arrow on the GPS would swing wildly and I realized I’d somehow slipped severely from our course. From the air I’m sure it looked like a random zigzag; a weaving, wavering track from point A to point B. It was easier when the visibility was good, especially once we had old tracks and flags to follow, but even then it was amusing to drive in the rear and watch the lead tractor drift to one side then swing back to the flag and drift to the other. Uneven track tensions, weight distribution, soft snow or sastrugi and the tractor would pull to one side or the other, throwing another variable into the mix. Far more difficult than it would seem! Beautiful day with perfect surface definition! We stopped at 6pm to refuel and chip the ice off the equipment. Dinner was heated in our little propane-powered oven and then we climbed into our unheated sleep kits – fleece liners inside huge sleeping bags nested within bulky over-bags. It was eerily quiet once the equipment was shut off. We had a small 5K generator, but for the most part we didn’t need it. Generators or equipment of some kind is almost always running in even the smallest camps. If the wind isn’t howling you can bet on hearing the roar of the gens. Out in the flat white between camps it was silent…just the tinkling of snow being blown across the surface like crystalline sand on a beach. WAIS and Byrd are only 100miles apart, but at 7-10mph it’s a very long day. We generally took two days to complete the traverse. Traversing across the flat white is less like a road trip by car and more like motoring across rough water in a skiff. It’s hard to steer straight and in the flat white there’s nothing to steer by. Sometimes the snow is flat and soft, and other times it’s rugged and hard. The HMW flexes and the whole load moves quite a lot. When things are tied too tight straps and HMW break, too loose and things slip and slide around, carefully stacked pallets disintegrate and fall apart. Every few hours we would take a break and a walk around to check the loads and straps. The WAS Recovery crew at Byrd had settled in nicely and had made major progress by the time we arrived. They had the Galley Mod opened up, heated, and in use as the galley and comms area. A yurt-like Arctic Chief tent provided an alternative heated space and an area to dry clothes and hang out, while individual Artic Oven tents were set up for sleeping. 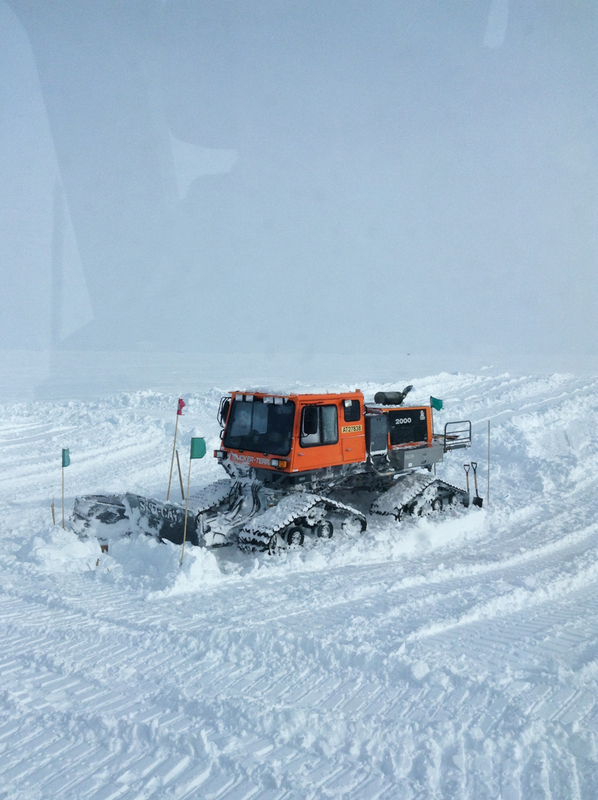 We stayed for 4 days grooming the skiway, raising flags, and excavating the berms with the Tucker blades. Then on Dec 10 it was back to WAIS. Two days to get there, a day to PM the Tuckers, unload the cargo from Byrd and load it up for our return trip, a day to shower, do laundry, and rest, and On Dec 14 it was back to Byrd. This time our load included the Caterpillar 297 skid-steerer – a dense little machine at almost 10,000lbs alone! The plan was to stay at Byrd for another few days, but as soon as we arrived we received a call on the iridium phone that the Heavy Equipment Operator at WAIS had been injured. So we unloaded our sleds as fast as we could and left early the next morning. 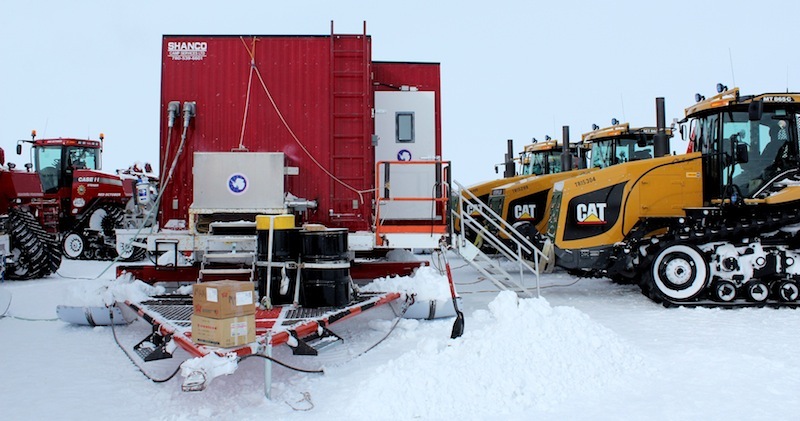 WAIS needed us back to keep camp going until they could get a replacement HEO from McMurdo and to train up the new HEOs on operating in the deep field. This time we took only one Tucker, leaving the other at Byrd so they could keep grooming and excavating. Taking turns driving we made it back to WAIS late that evening. At least we didn’t have to worry about it getting dark! At WAIS Divide we bucketed and pushed snow, forked pallets around, groomed town and the skiway, built pallets, and loaded Hercs. Another Tucker, China Doll (the one we’d had at Byrd in 2012-13) was needed at Shackleton camp. Being most familiar with the machine, I got to drive it onto the Herc! It was fairly exciting as there was no room for error. While at WAIS we also got an opportunity to fly out via Twin Otter to help retrieve gear from a small camp at Pirrit Hills. This site is located closer to the base of the peninsula, an area I had never before visited. Mountains appeared on the horizon and then the hills themselves appeared ahead of us. The term “hills” is misleading…it’s an epic, jagged peak rising from the glacier with razor sharp ridges and massive granite faces: Utterly awe-inspiring. The impressive “hills” rise several thousand feet from the surrounding ice. We spent two weeks at WAIS helping with camp operations and training up the new Heavy Equipment Operators. On December 31 it was time to leave again. This time we took the Tucker and one of the Challenger 55s. The Challengers can pull 70,000 pounds…7 times as much as the Tuckers. We hooked up three sheets of HMW with a “CRREL tool” and secured several decks for cargo. The New Year found on us halfway between camps, in the great, empty, flat white of West Antarctica. Already into January we had our work cut out for us. Almost all the flights to Byrd were cancelled for one reason or another and every flight that cancelled meant more cargo for us to haul back on traverse. We did six traverses in three weeks, using both Challengers and a Tucker, and closed out Byrd on January 17th leaving just a few of the larger pieces on new tall berms. Byrd has a long history (…link to hx page…) and I’m sure someone will return someday. 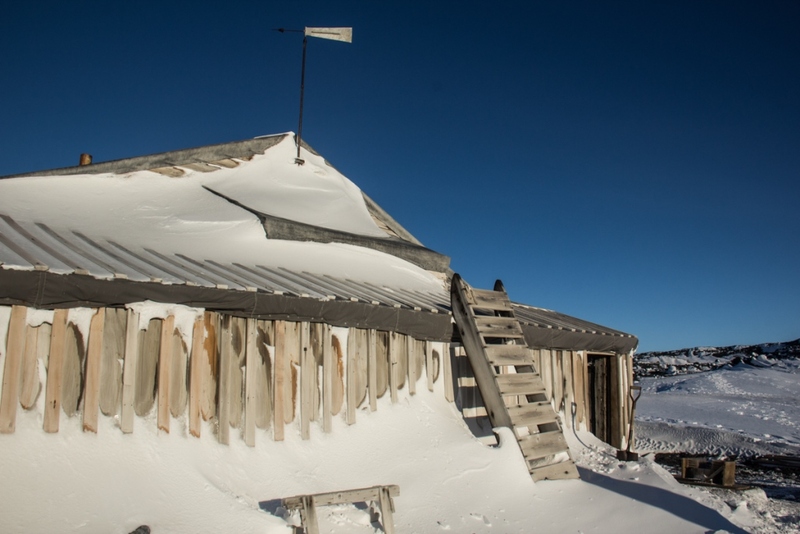 Perhaps it will be a short seasonal camp again or maybe even the eventual hub for USAP operations in the West Antarctic as it was in the 1970s and 80s. The long legacy of research and infrastructure here unfortunately means that there is quite a lot of buried stuff. Old buildings are certainly scattered beneath the surface and I am sure there is plenty of lost and buried cargo as well…rumors abound telling of lost bull dozers and shipping containers. We had a GPR (ground penetrating radar) unit with us on traverse and scouted around the Byrd area mostly checking to make sure we hadn’t lost anything from this last go around. We didn’t see anything recently buried, but there were plenty of buried items deeper down between 20-60ft. I have no way of knowing exactly what they are and I guess I never will, but it certainly is intriguing! We cleaned up the last of the pallets, sent off the WAS Recovery team via Twin Otter, and headed back on our last trip to WAIS Divide. It was late January by then as we had just a week to clean up and winterize the traverse equipment and gear. Back to McMurdo on Jan 27 and back to beautiful New Zealand on the 30th! What is that dark stuff? Big Blue 155 in McMurdo! Ross Island dominated by Mt. 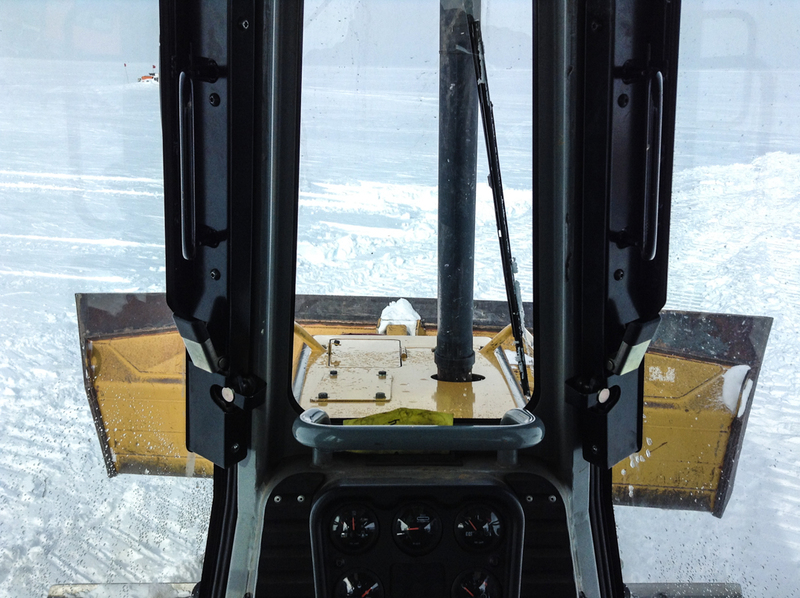 Erebus in the center as seen from out on the ice shelf. McMurdo and Scott Base are located on the dark area to the left. 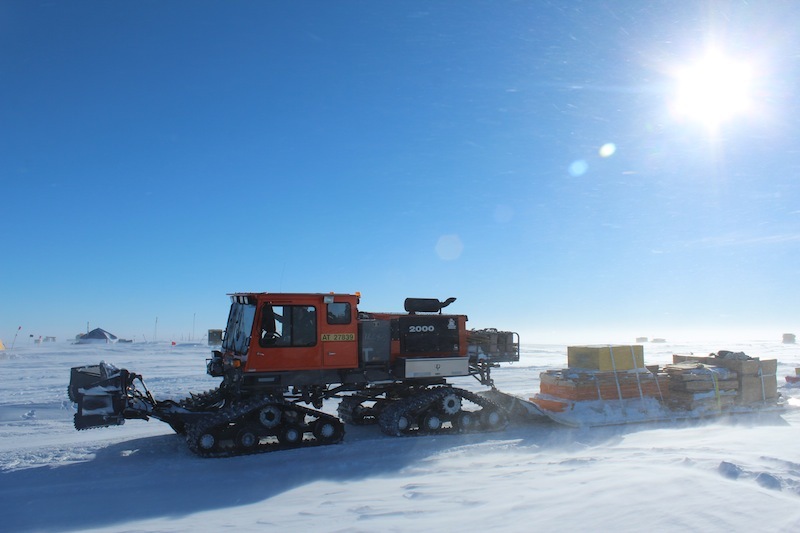 CRREL: This year I’ve spent a fair bit of time assisting some friends with the Cold Regions Research and Engineer Laboratory (CRREL) as they conduct ground penetrating radar (GPR) and GPS surveys of the McMurdo area. 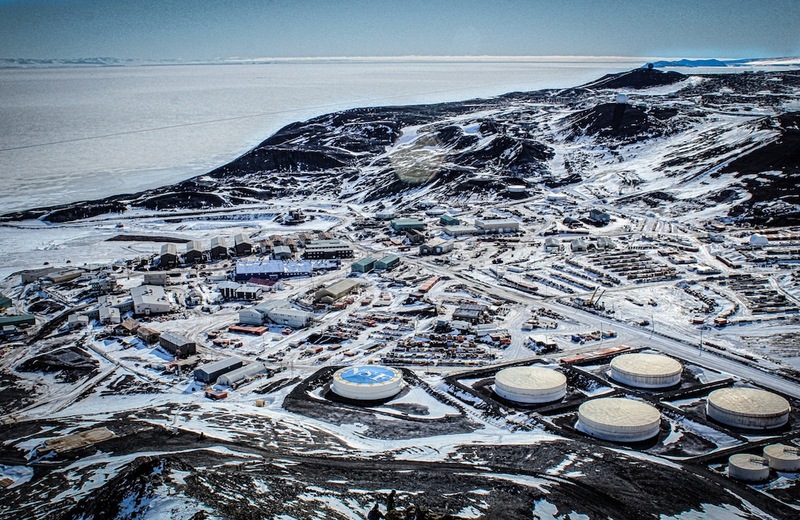 One project is looking at the structure of the McMurdo ice shelf. With the airfields and runways built out on the flat ice it is an integral part of USAP logistics and would pose a huge problem should a large piece calve away unexpectedly. To do the survey we towed 200MHz and 400MHz GPR devices behind snowmobiles along predetermined transects using a precision Trimble GPS unit to record location and elevation. Ice cores were manually collected to determining the depth of the brine layer – essentially the ice depth at specific points. The cores ranged from 5-16 meters deep! The sea ice, which may break up during the summer, is roughly 1-7m thick, while the ice shelf which remains frozen year-round reached depths of greater than 40m! 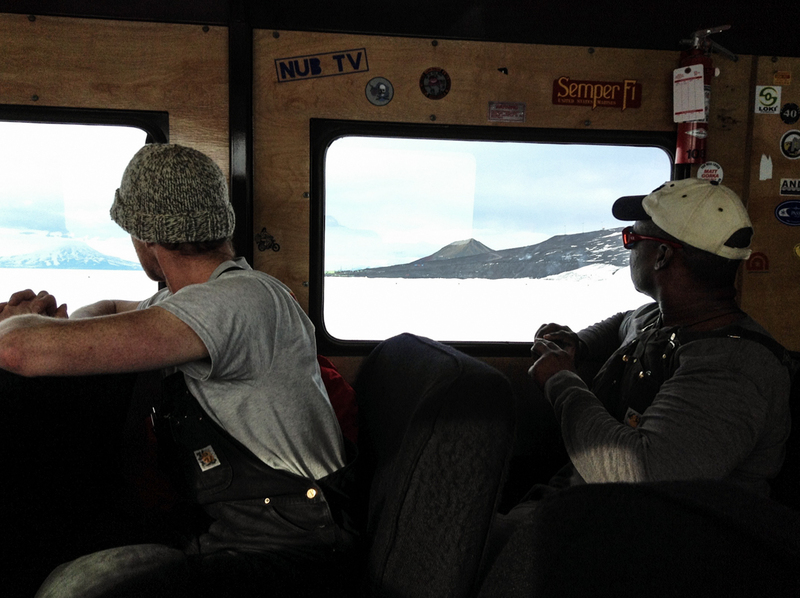 Another project was examining the geology and bedrock structure of the McMurdo area in town. While there are still significant patches of ice and snow it’s starting to melt out and most of the roads are clear by now. We made an amusing sight: one person in the lead with a rope around their waist dragging a bright pink plastic sled loaded with a big orange box along the gritty uneven rock roads and hillsides…the other person walking next to the sled wearing a yellow backpack with a big antenna sticking out the top. Dive Tending: One morning I got to assist the Divers. On that particular day they were recording water column visibility along a steep drop-off not far from the station. 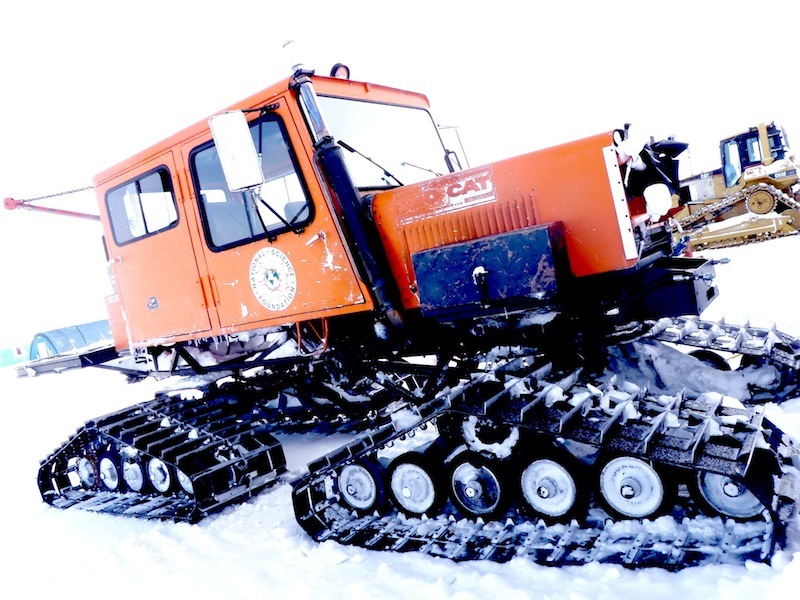 We met in town and loaded up a Pisten Bully with all their gear and supplies. Out on the ice we stopped at one of the “Fish Huts.” Small brightly colored buildings, the heated huts sit over maintained holes in the ice at designated dive points. Bundled up in long underwear, a full insulated down suit, and a sturdy dry-suit the two divers were uncomfortably warm while we got everything ready. Gear was brought inside the hut and a line was tied off to the hut wall and then lowered into the water with strobes, flags, and an emergency air tank. In the dim light under the ice and with very limited places to surface it is imperative not to lose the dive hole! Then sitting at the edge of the hole, with practiced efficiency, they pulled on their hoods and masks, strapped on their weights and flippers, locked on their thick lobster-claw mittens, and hoisted on their air tanks and regulators…and then they slipped into the hole! With a burst of bubbles they sank down the 3-4ft hole through the sea ice and disappeared into the dark water. 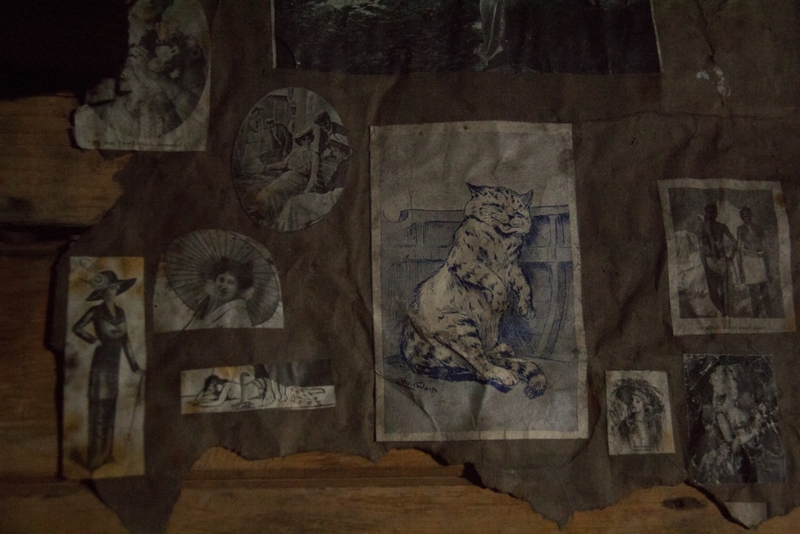 Once they were gone I lowered the ladder and closed the shutters of the hut. The sunlight filtering through made the ice glow an electric blue around the black water. The dive lasted about 20 or 30 minutes as I watched from above noting feathers, or platelets, of ice growing on the surface of the ~28F water and keeping an eye out for the divers as they swam under the hole. Before I knew it there was a mass of bubbles and one of the divers appeared in the hole. I assisted with hauling out their heavy air tanks so they could climb the ladder and warm up next to the stove. Then it was back to town in time for lunch! Pressure Ridge: An interesting feature in the McMurdo area is the pressure ridge. An area of ice that’s been forced together by ice flow and tidal movement it forms each year right in front of New Zealand’s Scott Base. With unrelenting pressure the ice is driven into the air cracking and breaking to form stunning features – the snow bright white and the ice glowing a deep blue. With so much relative ice movement thin spot and air holes form making it very popular with the Weddell seals in the area. Ob Tube: The Observation Tube (aka Ob Tube) offers a unique glimpse under the sea ice just in front of McMurdo. A tube, anchored to the ice surface, houses a ladder down 10ft or so to the base where there is a small round area with windows. Not for the claustrophobic, it is a tight fit and is quite dark. Some light filters through the ice to illuminate sea stars on the ocean floor while tiny fish, jelly fish, and pteropod “Sea Angels” float past the thick ice rimmed windows. Perhaps most notable is the texture of the sea ice base. While the top of the sea ice is a varied terrain of snow, blue ice scoured clear, or area of melt later in the summer, the base is comprised of delicate sheets and leaves of ice called platelet ice. The seawater is below freezing here at ~28-29F on average and as the fresh water freezes a salty shimmering brine solution is formed just below the ice level. Later in the summer the ice will thin and possibly break up here so the Ob tube is a temporary feature only deployed for a few weeks in November. Arrival Heights: Arrival Heights is an area just Northeast of McMurdo Station proper, not far from the Castle Rock hiking loop trail. 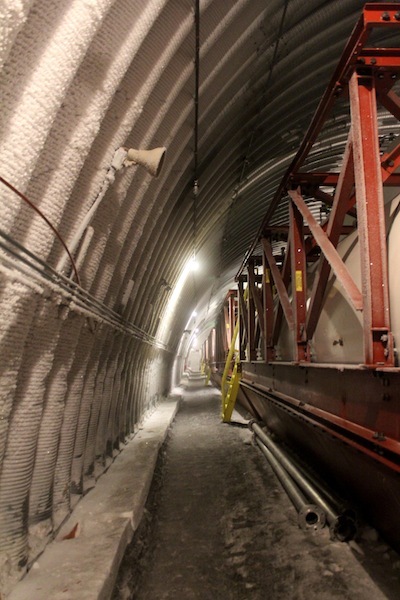 It is an area reserved for clean air sampling and radio and light sensitive experiments – a bit like Summit’s Clean Air Sector and South Pole Dark Sector combined. Several special camera suites study auroras so in the winter the use of lights is kept to a strict minimum. Other experiments are looking at the ionosphere and magnetosphere (space weather) utilizing huge antenna arrays which are highly sensitive to radio transmissions. 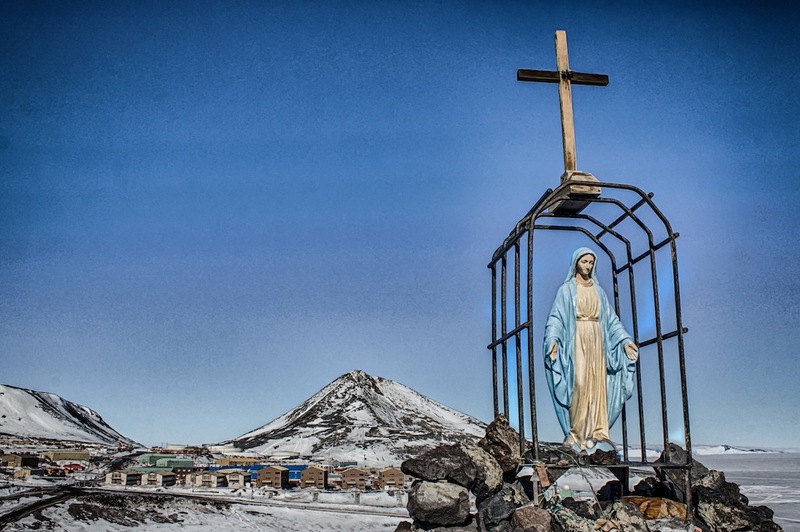 As an Antarctic Specially Protected Area (ASPA) it is off limits to the public at large, however occasional guests are permitted as long as they are accompanied by official personnel and traffic, either by foot or vehicle, is limited to designated routes only. Exposed to some brutal winds it also offers one of the most beautiful views with the Royal Society Mountain Range clearly visible to the West and unhindered views North towards Cape Evans and the sea ice edge. 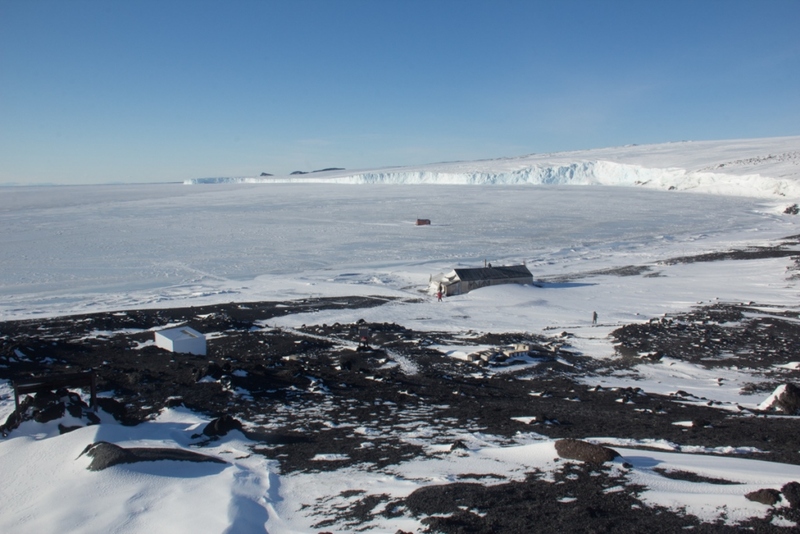 About 20km North of McMurdo Station on Ross Island is Cape Evans. 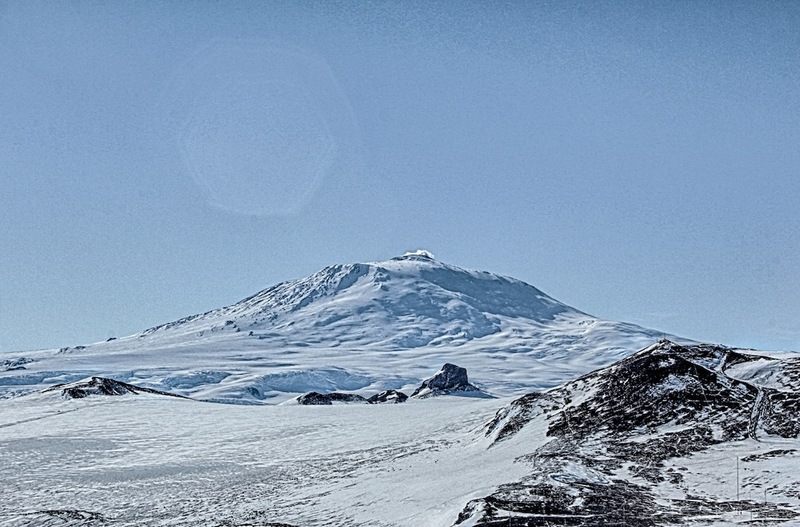 Named for Robert Falcon Scott’s second-in-command Lieutenant Edward Evans it was the staging point for the British Terra Nova Expedition of 1910-1913 . In the austral spring of 1911 Scott and several of his men set out to be the first men to reach the South Pole. For more information on that check out this fantastic 2011 article Race to the South Pole by the National Geographic. 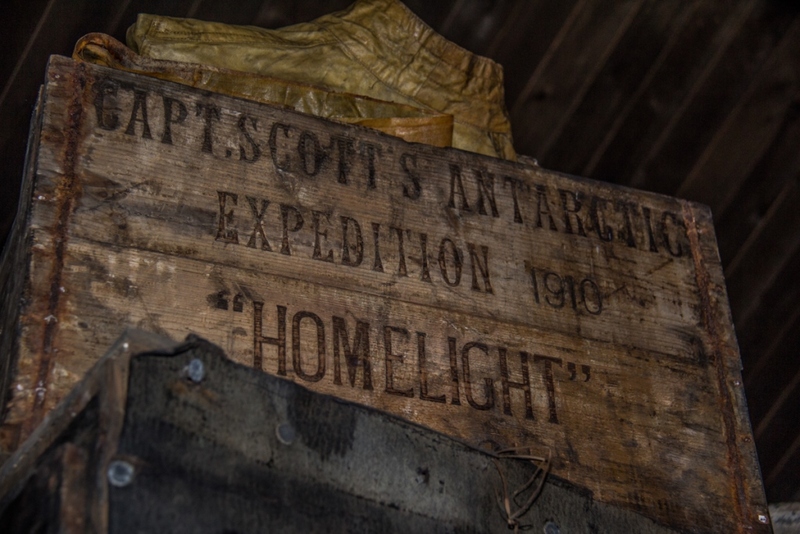 They arrived on January 17, 1912 to find a tent and a note from Roald Amundsen who had reached the South Pole first on December 14, 1911. Their dreams dashed, they headed towards the coast, however suffering from malnutrition and cold injuries there were no survivors. This is of particular historic significance as it was this brutal expedition that arrived at the South Pole (just behind Norwegian Roald Amundsen) and from which Scott never returned. 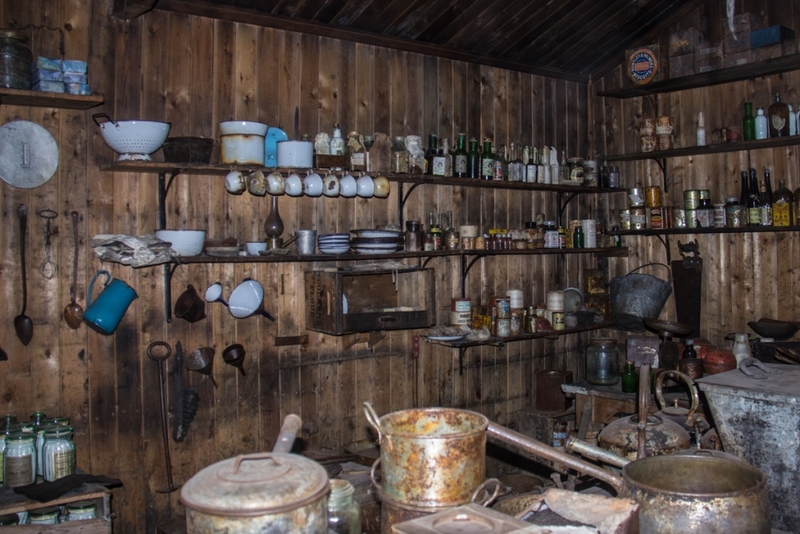 Several men remained at Scott’s Hut for the winter of 1912 to search for Scott’s party, however in 1913 they left Antarctica as well, leaving Scott Hut stocked with supplies. 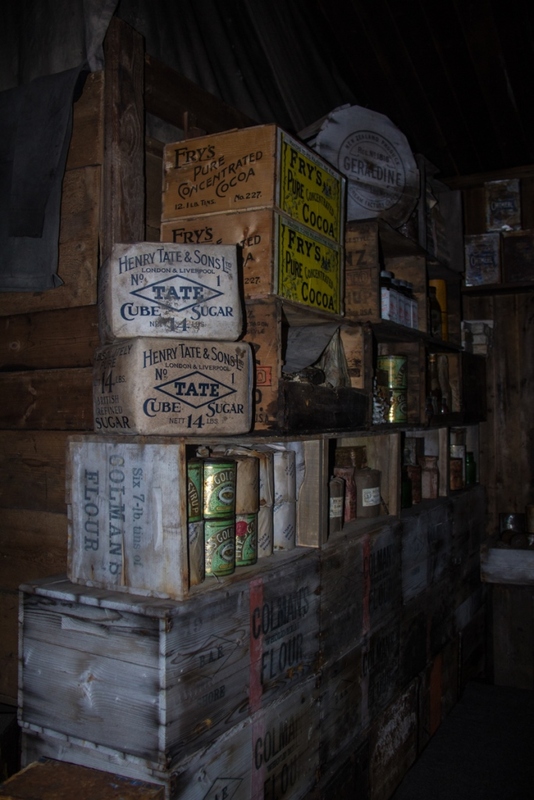 The Hut was used again in 1915-17 by 10 men from Ernest Shackleton’s Ross Sea party after their ship, the Aurora, with the rest of the crew, broke adrift and was taken North in the ice in May 1915. The Ross Sea party was the counterpart to Shackleton’s 1914-17 Imperial Trans-Antarctic Expedition expedition, the ill-fated attempt to cross the continent. They were responsible for laying supply depots for Shackleton’s return from the Pole, however Shackleton trapped in the ice aboard the Endurance, failed to ever reach the continent itself and so the entire effort was for naught. 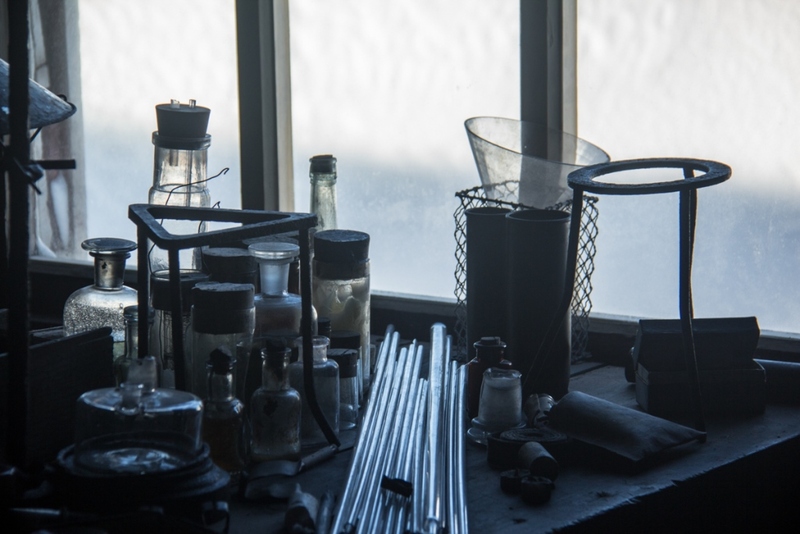 Due to sub-freezing temperatures, low humidity, and conservation efforts by the US and New Zealand and the Antarctic Heritage Trust both Scott’s Hut and Discovery Hut have remained much as they were left in the early 20th century; Beds are made with shoes tucked beneath, a desiccated and partially dissected penguin lies on a table, glass vials of medicine and solutions line shelves while the kitchen is well stocked with tins and cartons of various food stuffs. 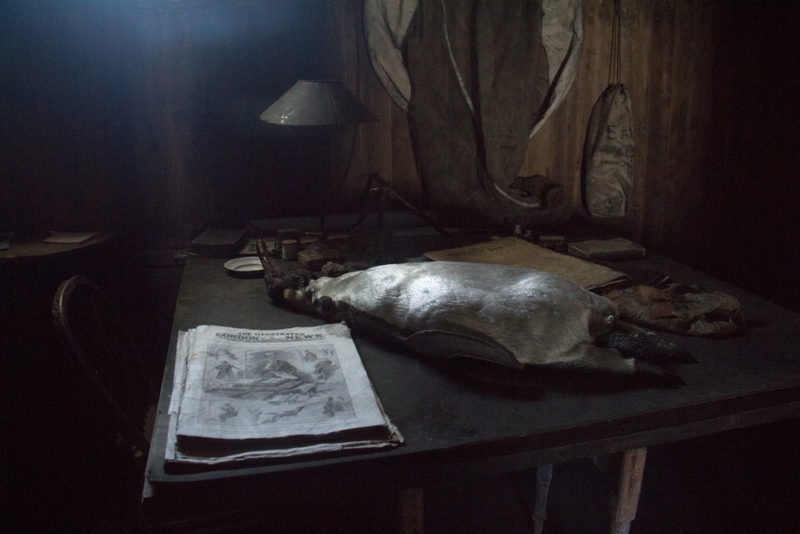 A massive pile of seal meat is stacked out in the covered storage area, fairly well preserved for being over a hundred years old, though smelling a bit rancid…The entire site is full of amazing artifacts from the expedition such as snowshoes for their ponies, and cartoons tacked to the wall. 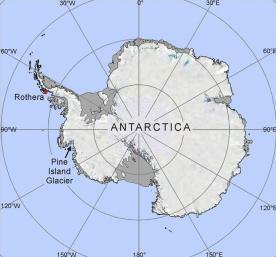 There is a long history of traverses in Antarctica. From the original expeditions to explore the mysterious frozen continent and reach the South Pole accomplished via foot, ski, and sledge to the modern day tractor traverse endeavors. 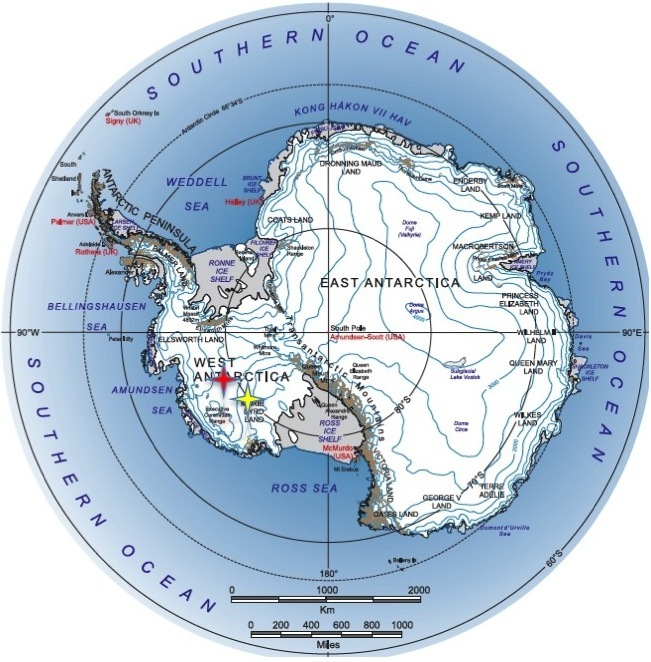 One of the first tractor traverses was across West Antarctica from the Little America base to establish Byrd Station during the 1956-57 International Geophysical Polar (IGY) year. 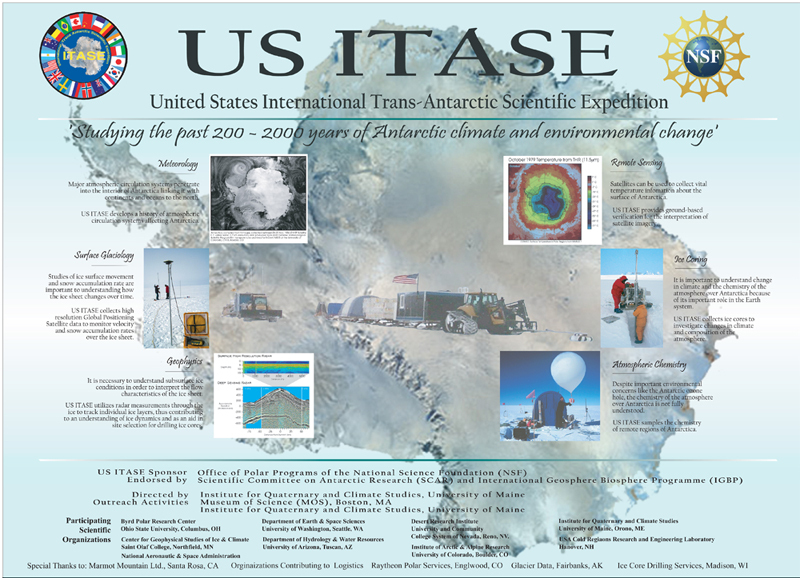 In 2007-08 and 2008-09 the Norwegian-U.S. Scientific Traverse covered much of East Antarctica collecting data on past climate. Since then there have been several more traverses to assist the Pine Island Glacier (PIG) camp and WISSARD project. 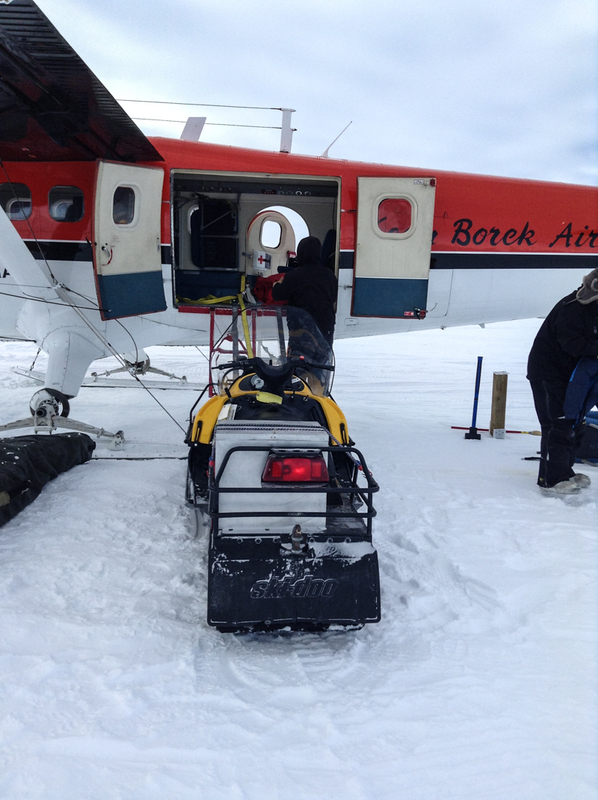 Last year and this season traverses were used to retrieve cargo left at Pine Island Glacier and Byrd. 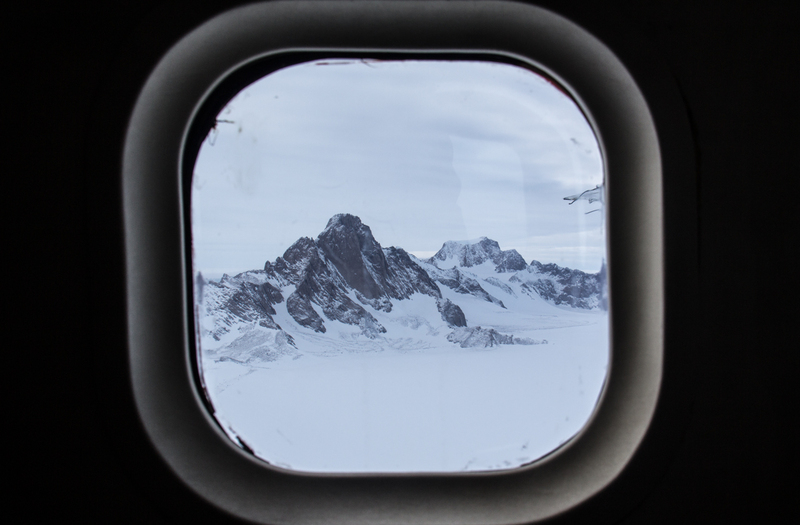 While there are a growing number of small tourist/exploration traverses via trucks or ski, most modern traverses support scientific projects that require mobility and various sample sites along the traverse route. Alternatively, some traverses are simply for moving cargo and/or fuel. However counterintuitive, it is much cheaper to drag weight over the snow behind tractors than it is to fly it! Our little traverse this year and the PIG traverse last year fall into this category. Perhaps the most well-known traverse is the South Pole Overland Traverse (SPOT) that hauls fuel from McMurdo, where it is supplied via ocean tanker, to the South Pole Station. The Antarctic Sun published an article in 2008 covering SPOT which can be found here: antarcticsun.usap.gov/features. All operations down here rely on a low-grade jet fuel. It’s what the LC-130 Hercs and other aircraft burn as well as being close enough to diesel that all our heavy equipment and generators run on it as well. Some additives are added for Antarctic operations to lower the freezing/gelling point – thus the AN-8 or JP-8 terms used. At the South Pole large generators burn this fuel to supply power to the station. The waste heat is captured to melt snow for water and to heat the main station. Heavy equipment is necessary to clear snow from around the buildings and berms, groom the skiway for the planes, and move cargo. It’s vital to supporting science and life down here. They burn over 300,000 gallons annually. Summit Station in Greenland on the other hand, burns only about 40,000 gallons while WAIS Divide (a large deep field camp) goes through roughly 45,000 gallons during the summer season. WAIS burns so much fuel in part because it initially supported a 24/7 deep ice core drilling operation, which required massive generators. Since drilling has ceased they have primarily supported airborne surveys of the region with Twin Otters and Baslers, which also uses significant amounts of fuel. At the year-round stations the big push in the short summer season is building up the fuel reserve for winter. 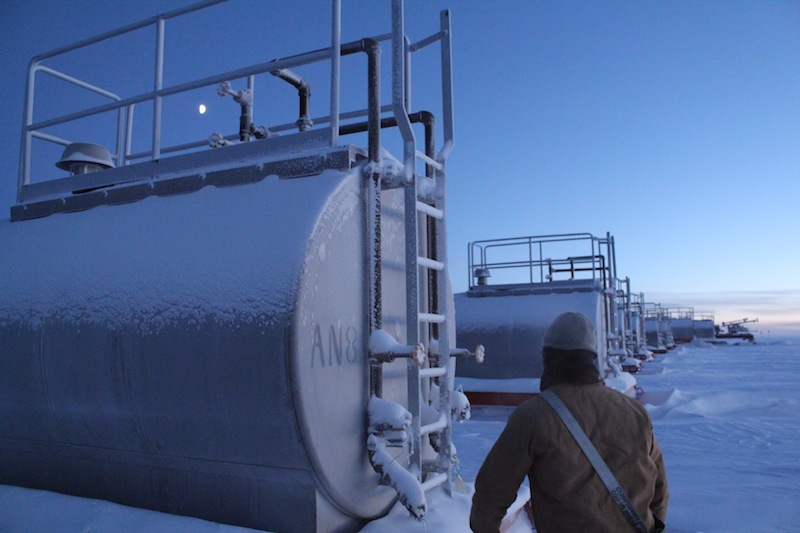 Ideally 50,000 gallons are on site at Summit Station in Greenland before the end of summer and more than 400,000 gallons at the South Pole station! Typically, fuel is flown in via Hercs, however this is a terribly inefficient process. I’ve been told various ratios and it depends heavily on winds and cargo loads, but on flights to the Pole Hercs burn between one and three gallons for every gallon delivered. A few years ago the South Pole Traverse was developed as an alternative to supplying fuel to the South Pole. In Greenland a similar operation called the Greenland Inland Traverse, or “GrIT”, is used to haul fuel from ocean tanker supplied Thule on the NW coast to Summit Station. After a full week of traveling around the world from Greenland to Antarctica I arrived at McMurdo Station on October 23.This year I’m working as part of the WAS (West Antarctic Support) Traverse driving across Marie Byrd Land between WAIS Divide and Byrd camp in the “Deep Field” of West Antarctica. It’s a small endeavor with just 3 of us: two heavy equipment operators and a mechanic who will stay at WAIS for the season. The rest of the deep field team is here already: the 2-man crew for Siple Dome camp, the larger WAIS Divide staff, and the 4-person WAS Recovery team headed out to Byrd camp. 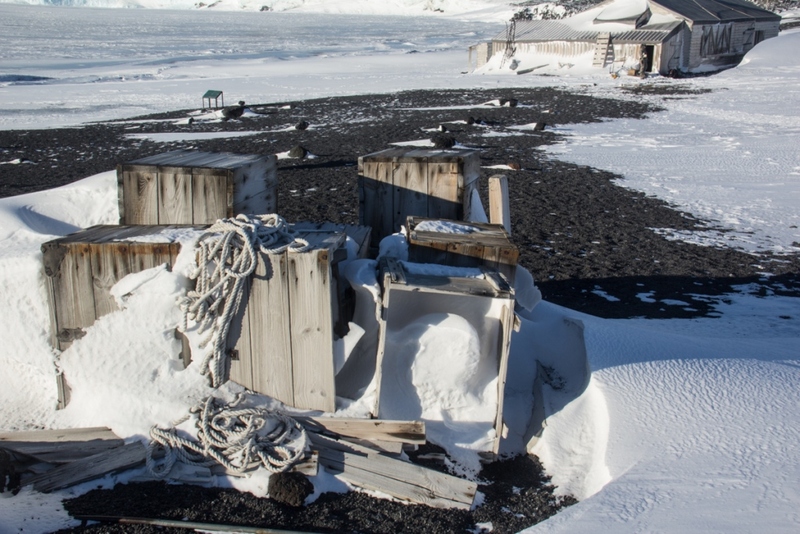 For more on the interesting history of Byrd Station check out this Antarctic Sun article from 2009: antarcticsun.usap.gov. Once WAIS Divide puts in and gets somewhat settled we’ll fly in to dig out our gear and equipment that wintered there. Meanwhile, the WAS Recovery crew will fly out to Byrd and begin setting up camp and unburying the berm. We’ll stay at WAIS for a few weeks while the machines get thawed out and our sleds set-up with all the gear we’ll bring with us. Then the two of us will load up two Tucker Sno-cats and drive the roughly 100 miles to Byrd. At Byrd we’ll help the WAS Recovery team dig out cargo and camp supplies, rebuild pallets, and load up Hercs with stuff that can fly out. 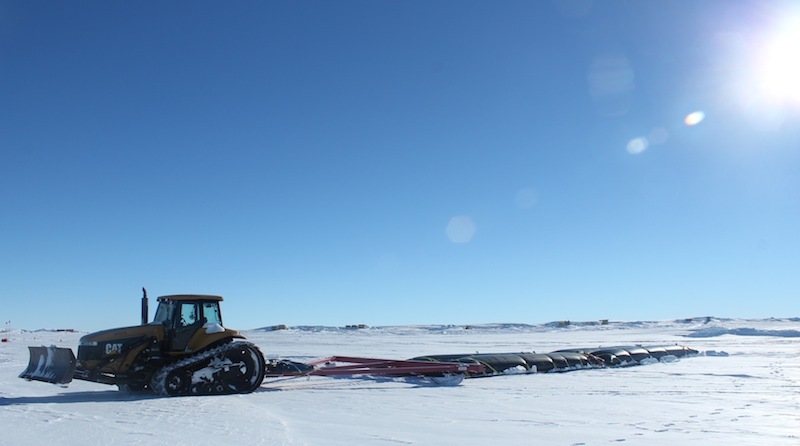 We’ll also be available to haul back loads as needed to WAIS for use, storage, or to be returned to McMurdo. Our season is flexible, we’ll make at least 2 trips, possibly more, using Tuckers and/or Challenger 55s as they get brought up and checked over. 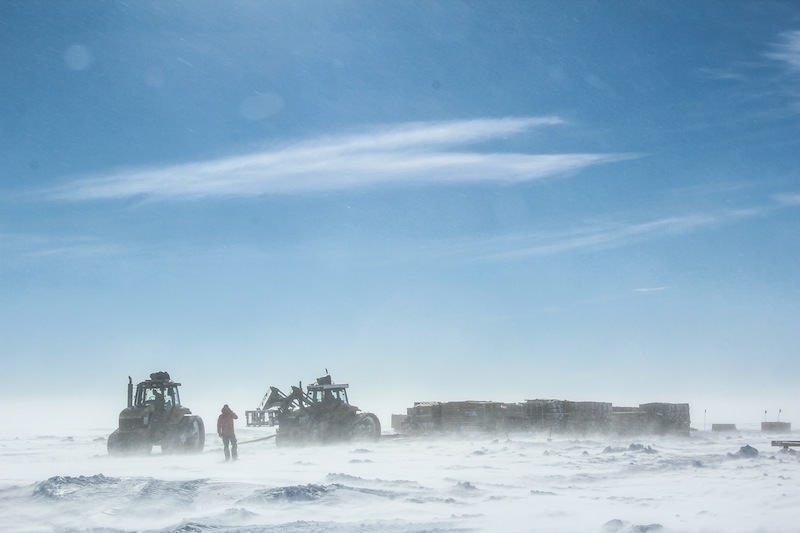 WAIS Divide was established in 2005, as the site of a deep ice core. A decade later it is still in use providing support for several science groups and a population of up to 50. There will be a full galley mod, a designated cook, and a wash tent with showers though we’ll sleep in unheated tents on the polar plateau. Byrd on the other hand will be minimal, much like PIG last year. We’ll have unheated “Arctic Oven” tents, aka AOs, to sleep in, the hard-sided galley mod, and a yurt-like Arctic Chief heated tent as a secondary heated space. The Traverse will be comprised of two pieces of heavy equipment and two mountain tents (2 person 3-season) to sleep in. We’ll take two days, though it’s just 100 miles, so as not to strain the equipment especially while pulling a load. In the heart of the West Antarctic ice sheet the terrain between the two camps isn’t the most exciting: Flat White. Still, I’m looking forward to the experience of driving between camps. We’re not entirely sure what to expect at Byrd. We did a brief trip out there last year to recover some high priority gear needed for groups this season, but that area of the continent gets a fair bit of accumulation so we’re hoping it’s not too buried! After four flights and over 28 hours of travelling I finally landed in Christchurch, New Zealand. It’s spring in the southern hemisphere and lovely, with vibrant leaves and birdsong. The next morning, we assembled at the Clothing Distribution Center (aka CDC) for a welcome briefing and our ECW (Extreme Cold Weather) gear issue. 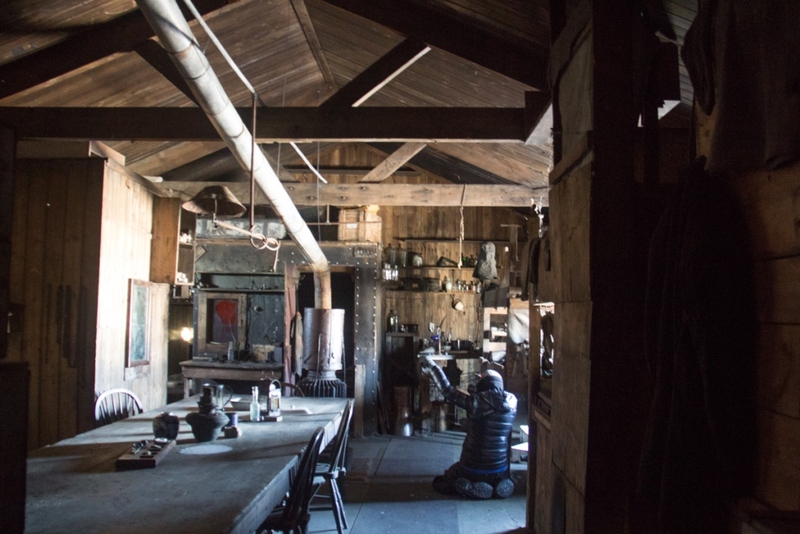 The standard ECW set includes everything you need to work and survive in the Antarctic climate – the enormous Big Red, insulated carhartt bibs and jacket, fleece long underwear, hats, goggles, mittens, gaiters, gloves, socks, and boots – either the Bunny, or Mickey Mouse, boots or the blue FDX boots. While Bunny boots are the classic white USAP footwear, they’re rubber and don’t breathe. FDX boots are a bit warmer and are leather/cloth so they breathe, but the soles are very thick (part of why they’re so warm) and there’s no ankle support so can be treacherous at times. 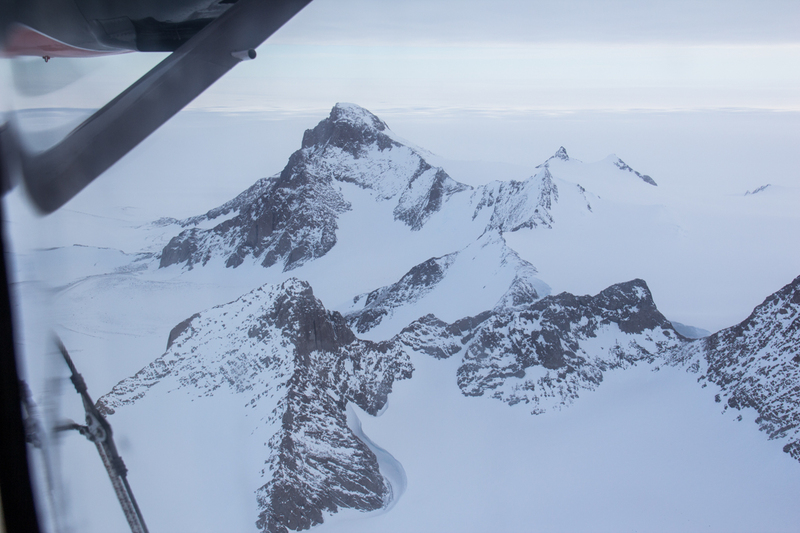 This season I’ll be heading out to Pine Island Glacier, near the coast in far West Antarctica (75°45’S 100°16’W and approx. 850m elevation), as part of the 4 person “WAS Recovery team.” It will be cold early in the season, but will become downright warm by Christmas and New Years – we’ve been told to anticipate heavy wet snow and even the possibility of rain! So I made sure to get good rain/wind pants and a “little Red” jacket that is more of a shell than parka. After getting our ECW and going through a few introductory briefs we were given our mandatory flu shots then had the rest of the afternoon to enjoy Christchurch and the botanic gardens. 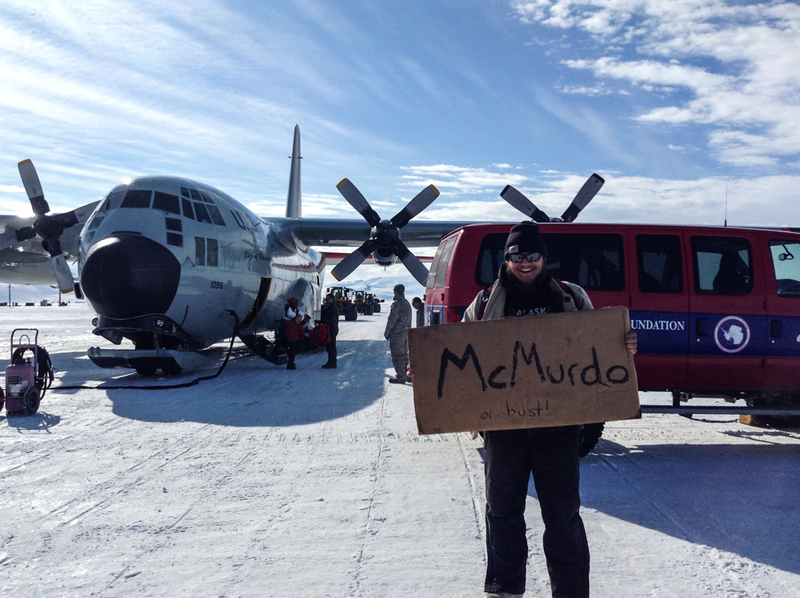 On November 3rd we flew to McMurdo aboard a US Air Force C-17. The whole West Antarctic family is here now: WAIS Divide, the PIG Traverse, WISSARD, Siple, and now the WAS Recovery Crew. A week or two is needed in town for training, to finalize cargo lists and put-in plans, and to round up all the gear and material needed for the season. A lot of these camps have been used season after season and most of their supplies were left overwinter on the berm. Our team is a bit different; while PIG was a large camp in 2012-13, this year we won’t be setting up the buildings or supporting any science. Our goal is just to recover the material. As soon as WAIS gets established we’ll fly out there on an LC-130, spend a night or two then load up a Twin Otter and fly to PIG, set up a few mountain tents and get to work excavating the berm. 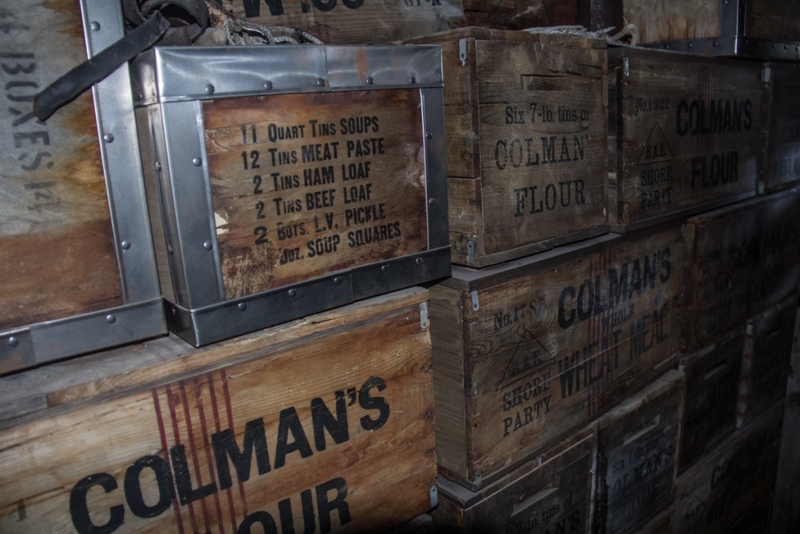 While there are a lot of supplies buried out there most of them are useless to us, our outfit is pretty bare bones. Without a skiway the planes can’t take in much cargo. We’ll be living in small mountain tents with one larger heated yurt-like tent. 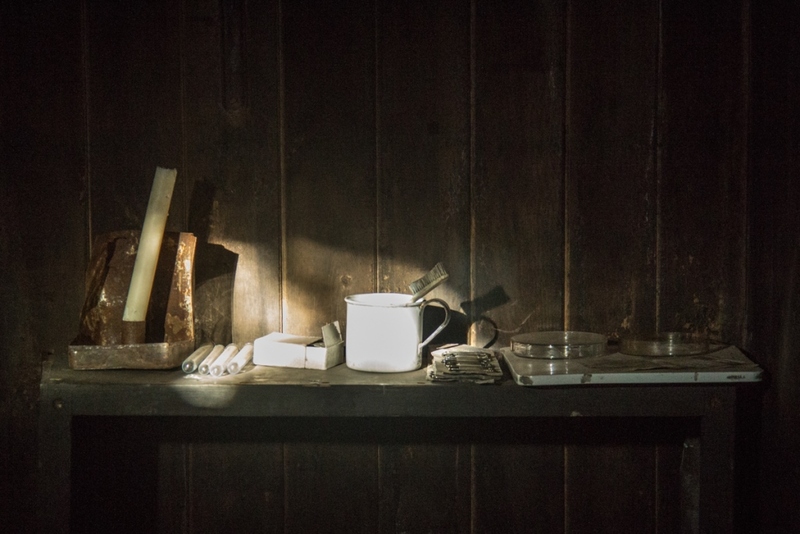 We’ll have no running water or showers, and will be cooking and melting water on camp stoves. There’ll be no internet or fresh food either. 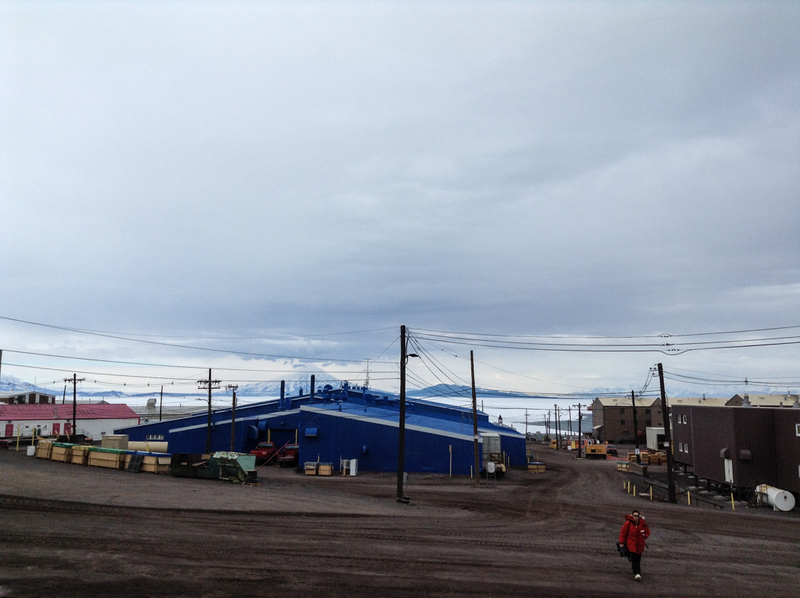 Our main focus this week in McMurdo has been to decide what to bring with us: how much food, what cargo, and which flight it will go on. We’re planning for two planes. The initial “put-in” flight will bring in our survival gear and us. 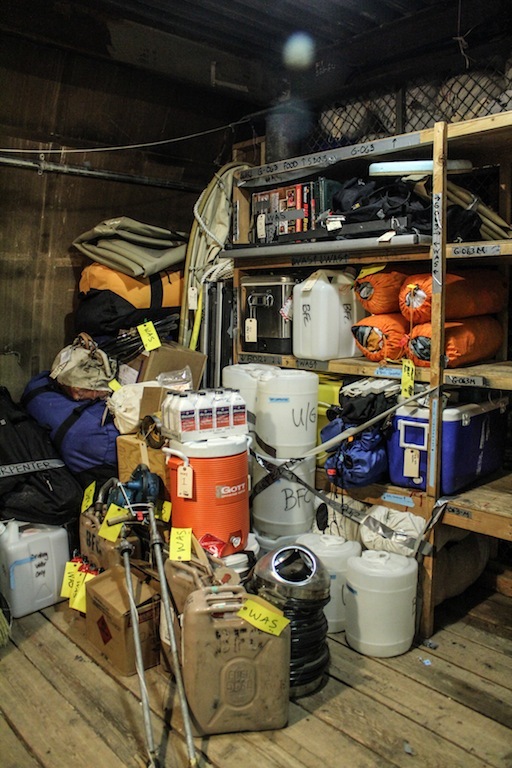 The cargo list for this flight includes our tents, survival bags, sleep kits, stoves and some fuel, a basic medical kit, comms equipment (satellite phone, HF and VHF radios), our Personal Locator Beacon (PLB for emergency use), a human waste bucket, a water jug, and our shovels. 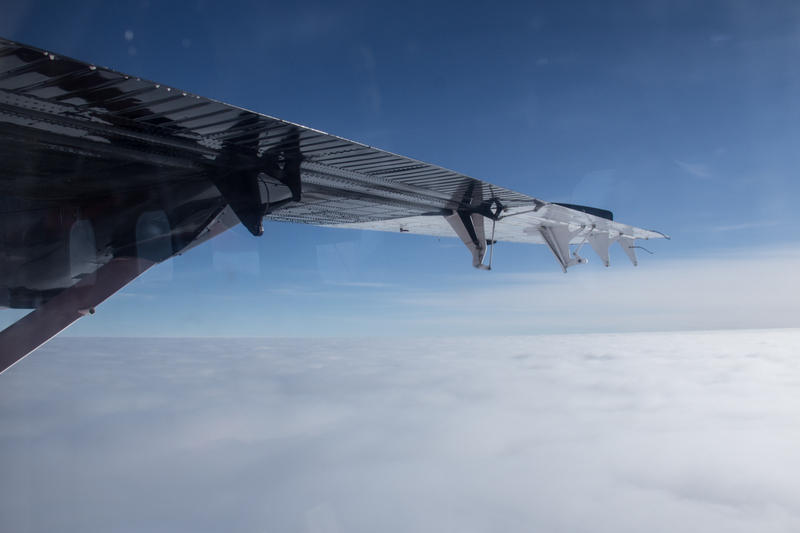 The second plane will bring spare parts, fluid and fuel for the vehicles out there, more food and tools such as a heater to warm up and melt out equipment. Of all the cargo, our shovels may be used most. 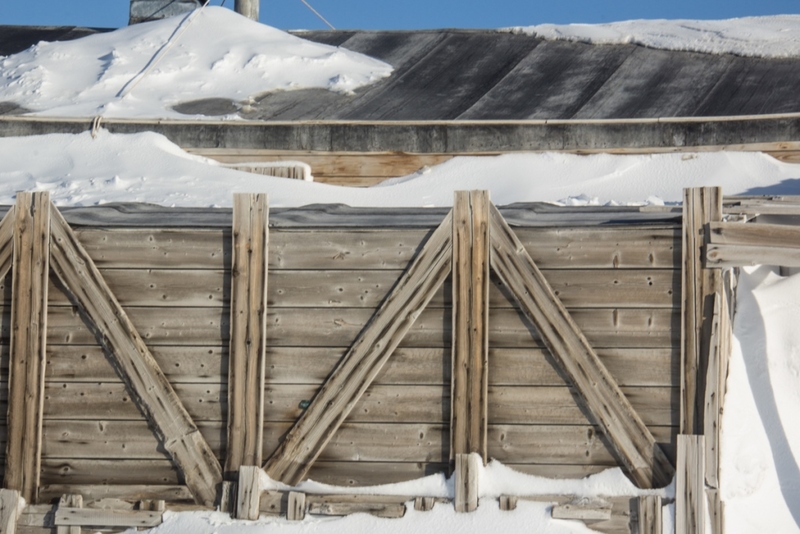 We’ll need shovels to knock down sastrugi to clear spaces for our tents, to dig out equipment so we can dig out the pallets, to clear drifts created by the wind, to mine snow for water. We’ll be shoveling every day. Professional D-1 Operators. “So what kind of shovels should we bring?” Our team lead asked. Immediately all four of us agreed: short shovels with square blades and D handles. We’ll bring a long handled one as an extra. Then we all laughed shaking our heads…not only do we know the types of shovels, but we didn’t have to think about which type we like best for shoveling this kind of snow! Is that a good thing….or have we been doing this too long? We were originally scheduled to fly out to WAIS Divide on the 15th, but there have been significant weather and mechanical delays so this date may well get pushed back.